Cottage cheese has always been one of my favorite ingredients to sneak into recipes for more protein. It has much higher protein content than most other dairy products and with a mild flavor, it is ideal for a large assortment of recipes. 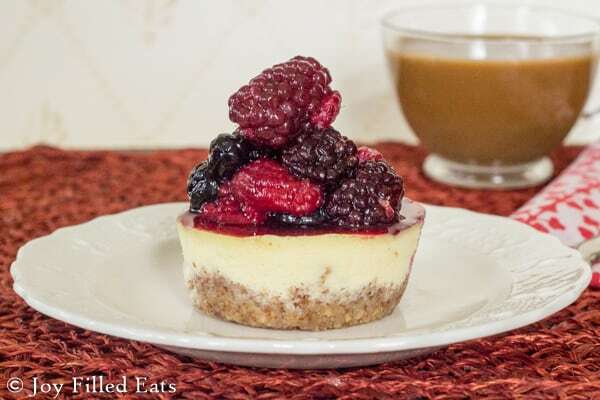 Over the years I’ve used Friendship Dairies cottage cheese in lasagnas, smoothies, egg bakes, baked goods, and especially in a keto cheesecake. It has a high protein content like Greek yogurt but works better than yogurt would in many recipes. This is a sponsored post written by me on behalf of Friendship Dairies. All opinions are 100% mine. Friendship Dairies makes my favorite snacking cottage cheese, their 1% Whipped. It is light, smooth, and creamy and I love to eat by the spoonful right from the carton. In recipes, I prefer the 4% cottage cheese because it is filling and rich. Cottage cheese has been around long before all the current healthy trends (no offense to kale, chia, or coconut everything) and is still The Original Superfood. With 14 grams of protein in each serving Friendship Dairies 4%, California Style cottage cheese is perfect to make the keto cheesecake filling enough for breakfast. With Friendship Dairies cottage cheese you can Fuel Your Fancy. This means that it will give you the energy to live and love life! My Mini Keto Cheesecake gave me the energy to be successful at my main job today. That is being a wife and mom of 4. My fuel needed to get me through the laundry, dirty dishes, cooking, cleaning, picking up kids from school, more cooking and cleaning, bath time, and the millions of other little things I do every day as a stay at home mom. What are you fueling for? Is anyone going spelunking or scuba diving today? How about parasailing or running a marathon? My day might not sound as intense as those options but I still need a good source of protein to get me going in the mornings. I’ve found that with Friendship Dairies and this awesome Almond Crusted Breakfast Cheesecake recipe. This makes 24 individual mini keto cheesecake. They freeze really well! I wrapped them in plastic wrap and froze them individually. To serve just thaw in the fridge overnight and then top with some berries. I eat two for breakfast or one as a snack. I buy Friendship Dairies Cottage Cheese at ShopRite. You can find other locations that sell it on their website. Make sure to visit because they also have a large assortment of recipes to inspire your own creations! Cheesecake for breakfast? Yes! Packed with protein so you can eat it guilt free! My Almond Breakfast Cheesecake is low carb, keto, sugar-free, grain-free, gluten-free, THM S.
Preheat the oven to 350. In a large food processor pulse the almonds, 2 tbsp sweetener, and 4 tbsp butter until a coarse dough forms. Grease two twelve hole standard silicone muffin pans or line metal tins with paper or foil cupcake liners. 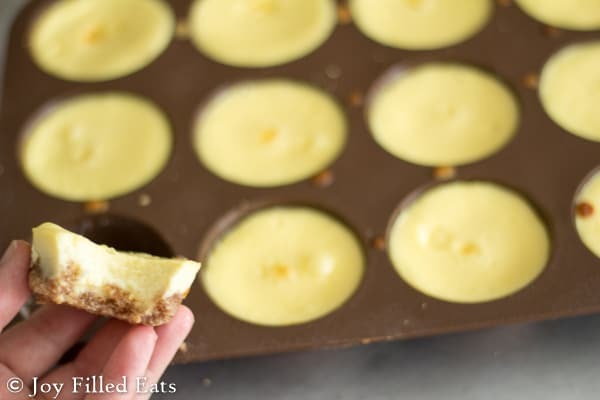 I used a silicone muffin pan for this and the cheesecakes popped out really easily. 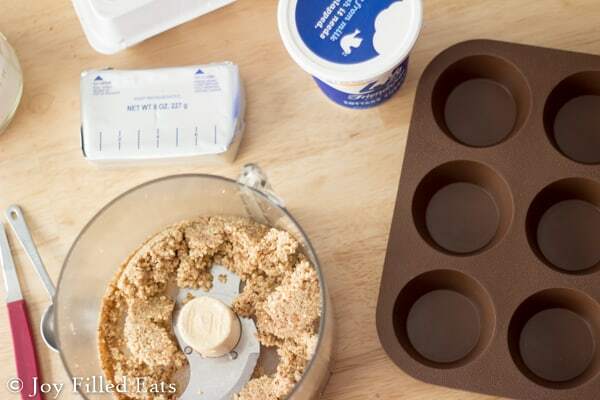 Divide the dough between the 24 holes and press into the bottom to form a crust. Bake for 8 minutes. Meanwhile, combine the Friendship Dairies 4% cottage cheese and the cream cheese in the food processor (you don’t need to wash the bowl). Pulse the cheeses until smooth. Add the sweetener and extracts. Mix until combined. Add the eggs. Blend until smooth. You will need to scrape down the sides. 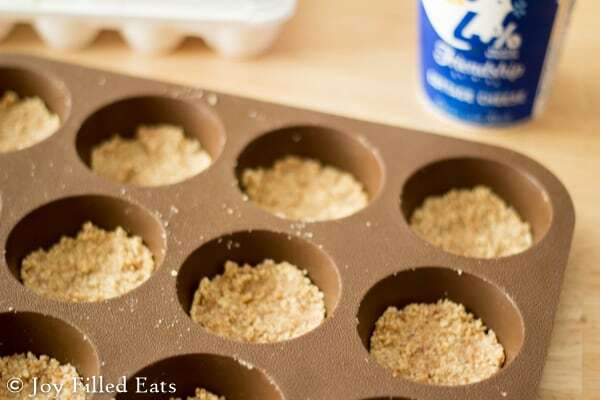 Divide the batter between the muffin cups. Bake for 30-40 minutes until the centers no longer jiggly when the pan is lightly shaken. Cool completely. Refrigerate for at least 2 hours before trying to remove them if you didn’t use paper or foil liners. 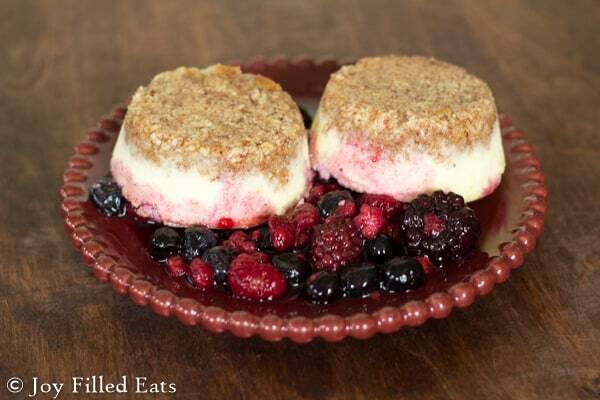 Serve with thawed frozen berries. This makes 24 individual cheesecakes. They freeze really well! I wrapped them in plastic wrap and froze them individually. To serve just thaw in the fridge overnight and then top with some berries. I eat two for breakfast or one as a snack. What could you use for cream cheese instead? A thick greek protein yogurt and add some thickner? And then cottage cheese? Am I making a mess? I can't do cream cheese. Help! Thanks! I'm not very familiar with making cheesecake without cream cheese. I'd try a combo of ricotta cheese and cottage cheese. That's correct. The prior comment was asking about making this without cream cheese. Mine turned out like a soufflé...very eggy, not sure if that’s how they should be or if I over mixed? I followed the recipe to a “t”...any suggestions? I’d like to try again. I’m no quitter when it comes to cheesecake! This is an eggier cheesecake since I was trying to increase the protein for a breakfast entree. You can use a couple less eggs if you prefer. just made this recipe and mine puffed up really huge and very aerated. What went wrong here? I'm don't bake very often so I have no clue what went wrong. Help! How did you mix the batter? It seems that a lot of air was incorporated somehow. 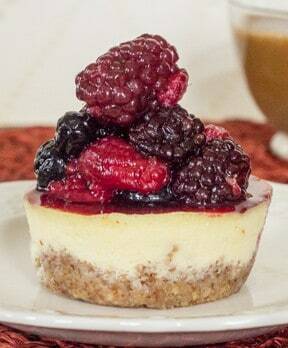 For a dense cheesecake you need a recipe that is mostly cream cheese. The cottage cheese makes this lighter. Can I just make one large cheese cake in a spring form pan and if I do how long would I bake it for? Does the nutritional value include the berries? These are sooo good. It does not. I'm glad you like them! Breakfast cheesecake?! Yes please! I love that these are made with an almond crust! This sounds like a great way to use cottage since, which I love but my husband does not (although I'm sure he would have no idea it was in these!). I LOVE this recipe! Beside the fact that "cheesecake for breakfast" is my new obsession, you used cottage cheese! My favorite "never gets enough attention" healthy ingredient! Thank you so much for this recipe! I have a demanding sweet tooth even though I really try to make healthy choices. I love recipes that don't make me compromise. This one is going to be used over and over again in my house! They are based on 1. Thanks Taryn, the cheesecakes are really good! Mine sank!! What could have gone wrong? Folled directions completely. They taste good at least! Mine sank a little too. That's why they are perfect to cover in berries :) Using so many eggs is why I think they sink. But the eggs help make this recipe protein-packed for breakfast. How many carbs in serving of Friendship Dairies cottage cheese? 1/2 cup of the 4% has 5 carbs. You can see nutrition facts for all their varieties on their website. What could I replace the cottage cheese with? I am dairy free, but this looks amazing! I'm sorry but I have no idea. I've never made a dairy free cheesecake before. Can you have cream cheese? Could I just use super fine almond flour instead of grinding the almonds myself? If so, how much? Coarse ground almonds work better for this recipe. If you try the finely ground almond flour start with 1.5 cups and add more by the tablespoon until it is the right consistency for a crust. These look so yummy! Could I use ricotta instead of cottage cheese, and get a good result with similar carbs? Yes, you can use ricotta. I think the carb count would be a little lower but I haven't run the numbers. Don't let any dogs get ahold of this because Xylitol kills them. I'm not sure about cats. Yes, we don't have any pets in my house but when I give my mom treats I remind her of this. can coconut flour be uses instead of almond? Coconut flakes might work. Not coconut flour in this recipe. The crust needs a coarser texture. I think coconut flour would just taste dry. 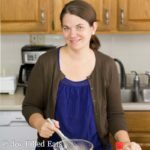 Can I use almond flour in place of the almonds? If so, how much? Yes. About 1 1/4 - 1 1/2 cups. I was confused by the chart..how much Truvia should I use in place of your homemade blend? It should be the same amount. 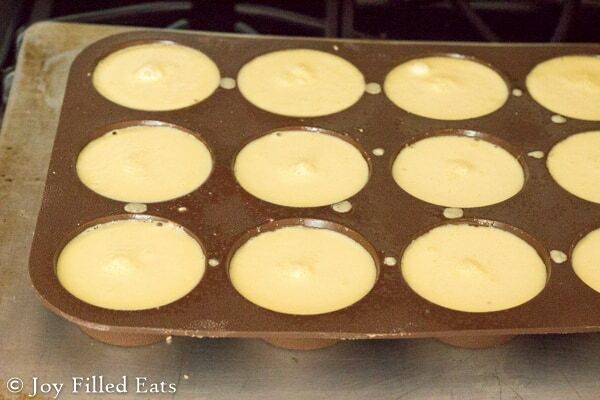 recipe says fill 24 holes----are you using the mini muffin pan or 24 regular size muffins????? 24 regular size. So two 12 count cupcake tins. sorry---I see -----I should read better next time---sorry to bother you! Do you know if using THM Super Sweet would work in this recipe (since the volume of sweetener would be reduced by half)? I'm pretty sure it would. Hi, do you have the nutritional chart for this? I just added it. This was based on the generic entry for cottage cheese on caloriecount.com so it might be off a bit. You can add it to another calculator if you want to get exact info. These sound delishous and I cannot wait to make them. Do you know if I would use pyure, how much I would use?